My name is Craig Henderson and I am Head of Programming for BBC English Regions. As part of my role, I take a lead on major initiatives when we work with colleagues across the BBC. As the Director-General Tony Hall launches the BBC's programme plans for the World War One Centenary, it will be the first time we talk publicly about the BBC English Regions and Nations’ World War One at Home project. This of course makes it a hugely ambitious project; 1400 stories, which must all be well told, and which reflect a whole range of different perspectives, across different media. The scale is dizzying, but I’m heartened by developments so far. First and foremost I am delighted with the sheer enthusiasm from the 40 plus (yes 40!) BBC producers from across the UK who are currently gathering these great stories. This plays to our strengths in the BBC’s Nations and Regions – telling stories steeped in a sense of place, through the eyes of the people (and their relatives) who lived through the experience of the First World War. Secondly I’m heartened by the support around us – our major partner in this is the Imperial War Museum. Their support, combined with the expertise of academics provided by the Arts and Humanities Research Council gives us access to stories, archive and (most crucially) the facts to ensure this great supertanker of a project stays on course. The BBC’s Learning department is also an important partner. The broadcasts of our fascinating stories will begin in early 2014, then in the Summer BBC Learning will create eight large-scale inspirational World War One events which will take place throughout the UK, reflecting the dramatic impact the war had on local families and communities. Drawing on the BBC’s programmes specially commissioned for the centenary and led by well-known BBC faces, each event will offer a unique opportunity to understand more about the war using hands-on activities and thought-provoking performances. 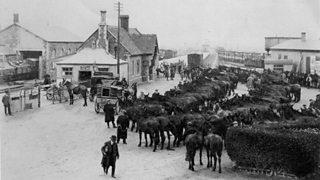 Mules were brought to Minehead before being sent to the Western Front. Just one of the stories that will feature in World War One at Home. Image courtesy of Daphne McCutcheon. When we first piloted the project in the West Midlands and in the West of England, we were worried we might not find enough stories. We need not have been concerned; the quality so far has been incredible and we think they’ll surprise, shock, inspire and delight you. As we prepare to launch them early next year (the stories will go out on the BBC’s Local Radio stations, with highlights on Regional TV in England and on national TV and Radio in the Nations), our ambition is for World War One at Home to shine a new light on a devastating war which changed the course of world history. I hope you will come away with new insight into its impact right on your own doorstep too. Read Adrian Van Klaveren's blog 'Introducing the World War One Centenary on the BBC'. Details of the launch of the World War One Centenary are available in a press pack on the BBC Media Centre website.